Fork truck pre-operational inspection conduct to ensuring all truck’s parts, fuel level and required services are correct and fork truck is safe for drive. Fork truck pre-operational inspection or checking is established and systematically conducted to ensure the all fork truck’s spare and parts, fuel levels, oil levels, greases, wheels and controls etc.. I.e. servicing of truck is satisfactory and correct to drive fork truck is safe for internal operations. Before the start any operation with fork truck, there is required to check out all the parts and other things that can cause accident. As per standard system of health and safety needs to verify fork truck and other equipment before use, the system is recommended for safety point of view and other mechanical requirements to check the fork truck before established any task for it. Fork truck is heavy equipment that need to care during any task assigned, that is reason that heavy equipment should be properly handled, care during the operation and timely inspection of all parts should be necessary for safety point of view. 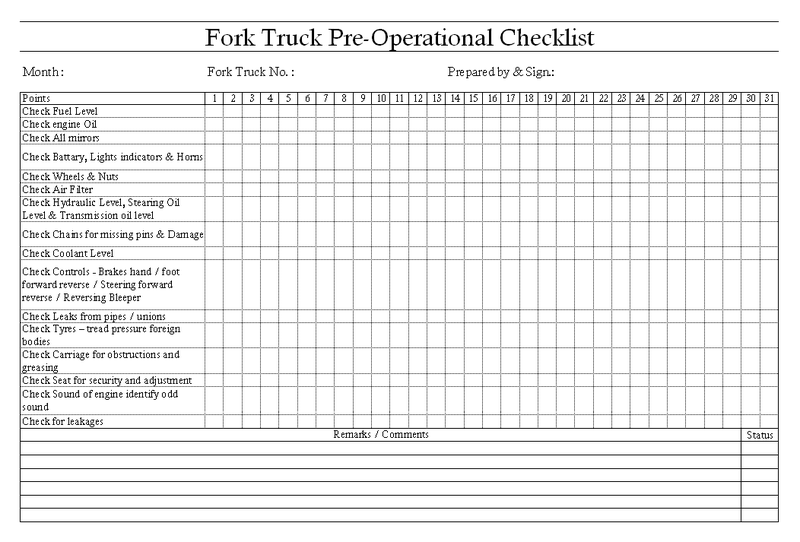 Fork truck pre-operation checklist is guidelines of helpful inspection document to conducting regular basis inspection to ensure safety and truck condition, fork truck pre-operational checklist having all the points and concern information are pre loaded to inspector get the idea what to check or what is on priority for inspecting and also helpful for step by step inspection of fork truck, in the points for checklist are mentioned by equipment manager during preparation of checklist, all the concern peoples are gives its opinion that fork truck’s sensitive parts which damage can harm truck & all truck works can be stopped in case the parts or any condition is not checked properly before operation start of truck.